State elections officials referred four-term state Rep. Rodney Moore, D-Mecklenburg, for investigation and possible prosecution, saying there was “clear and convincing evidence” he failed to report more than $141,000 in election campaign receipts and expenditures. The nine-member Bipartisan State Board of Elections and Ethics Enforcement voted unanimously Wednesday, Oct. 17, to ask the Mecklenburg County district attorney to investigate Moore, former campaign treasurer Tammy Neal, and the Committee to Elect Rodney W. Moore for misuse of funds, filing false reports, and obstructing a state audit. Moore, co-chairman of the House Finance Committee, lost a primary re-election bid in May. Neither Moore, Neal, nor anyone from his campaign appeared at the meeting to answer the allegations. Elections Board Executive Director Kim Strach said a routine audit into Moore’s campaign reports in May 2017 uncovered a series of questionable items, triggering an elections board investigation. Strach, who has conducted campaign finance investigations into former governors, House members, and senators since 2000, said there is strong reason to believe Moore’s election campaign spent money on impermissible items. She said most glaring were more than $25,000 in ATM cash withdrawals and cash-back transactions on retail purchases. “The whole point of campaign finance disclosure is that the public has the opportunity to see where candidates are getting their money, and how they are spending their money,” Strach said. “Clearly with this committee, the majority of transactions that came in and out of that committee, the public never got to see, so I think it’s very serious,” Strach said. She said some spending may have been legitimate. While Moore initially provided information, he refused to grant investigators access to his accounts, and ceased cooperating. That made it impossible to determine if some flagged items were valid. The elections board secured subpoenas for Moore’s bank accounts, which showed no entries after May 2017. Strach gave a detailed presentation of three bank accounts Moore’s political campaign opened, and how the numbers reported to the state didn’t match audit findings. The largest bank account reported deposits of $78,830. But more than 65 entries totaling $36,605 weren’t on campaign reports. Reports showed $16,593 was spent from that account. Investigators found more than 90 percent of spending — 1,689 items totaling $95,753 — wasn’t disclosed. A second account listed no contributions or expenditures. The investigation revealed 27 contributions totaling $3,160, and 66 undisclosed expenditures totaling the same amount. A third account showed $1,000 in contributions. Three contributions totaling $713 weren’t reported. The account recorded no expenditures, when there actually were 22, totaling $1,713. Strach said a report filed with the state listed $42,000 cash on hand in the account, when there was just $4,200, and it appears the account never had more than $6,000 in it. In other action, the board made several vacancy appointments to county elections boards, at least temporarily. 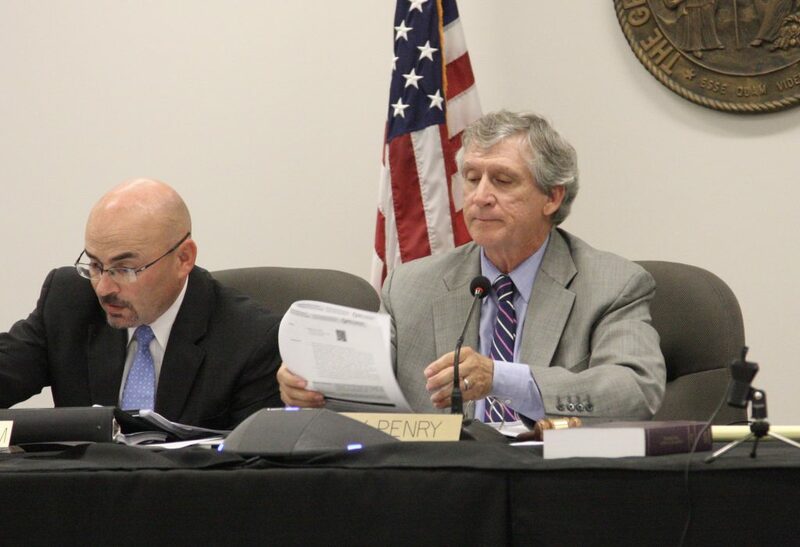 A three-judge Superior Court panel released a decision Tuesday invalidating a state law that changed county board membership from three to four. Elections board attorney Josh Lawson said the court ruling “cast substantial legal doubt” on county boards’ makeup, and which of the four members would be removed if the court ruling stands. The ruling creates uncertainty for the state elections board as well. It struck down the law altering the board’s membership and scope of duty as unconstitutional violations of separation of powers, and the governor’s ability to faithfully execute laws. The board will continue to operate until after the Nov. 6 general election results are certified. A constitutional amendment on the fall ballot would change the makeup and function of the board. The state board also adopted criteria to comply with a state law requiring electoral precincts to have more equal populations. Splitting fewer precincts would reduce the number of different ballots that must be printed, reducing counties’ administrative functions and costs. Brian Neesby, elections board chief data officer, said the new precincts would figure heavily into the redistricting process after the 2020 census. Board Vice Chairman Joshua Malcolm criticized state lawmakers for telling counties how to draw their precincts. Gerry Cohen, former special counsel to the General Assembly, told the board getting equal numbers in precincts isn’t as important as determining precincts’ election day turnout in peak elections for president and governor because 60 percent of ballots are cast during early voting. Consolidating precincts in rural areas could run afoul of election law if they split historic communities of interest, he said.